Welcome to Central Michigan Orthopaedics. Doctors who know, Doctors who listen, Doctors who care. It is our mission to make people better every day through excellence in orthopaedics and to provide each patient a compassionate experience. Our vision is to be the preferred provider in orthopaedic care, by meeting patient needs with the best quality, through excellence in patient care, growth in innovative technology solutions and integrity in the management of our practice. We can set appointments based around your specific scheduling needs. We offer walk-in care that you can’t find anywhere else. We utilize the latest, state-of-the-art technology and techniques available. Our Board Certified Doctors have years of experience in treating Orthopaedic conditions and specialize in sports medicine and sports injuries. 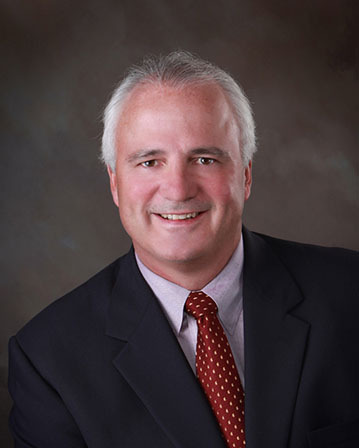 Dr. Charles J. Lilly is a Board Certified Orthopaedic Surgeon since 1987. Originally a native of Detroit, he has been in the Mt Pleasant area since 1985. He completed his undergraduate collegiate studies at the University of Michigan in 1976. He received his M.D. from Wayne State University School of Medicine in 1980. Choosing to pursue a career in orthopaedic surgery, he completed his residency in 1985 through William Beaumont Hospital, Royal Oak, Michigan. Dr. Lilly is affiliated with and performs surgery at McLaren Central Michigan Hospital, MidMichigan Medical Center-Gratiot & MidMichigan Medical Center-Clare. Dr. Michael J. Moutsatson, is a Board Certified Orthopaedic Surgeon since 2007. He is originally a native of Mt. Pleasant. He completed his undergraduate collegiate studies at Michigan State University in 1992. He received his D.O. from Michigan State University, College of Osteopathic Medicine in 2000. 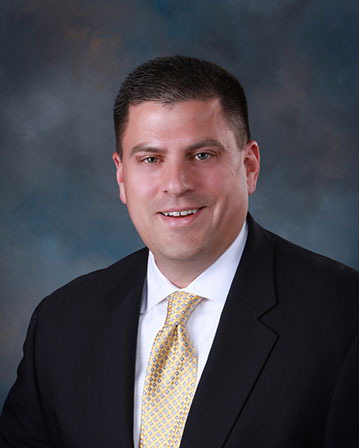 Choosing to pursue a career in orthopaedic surgery, he completed his residency in 2005 through Genesys Regional Medical Center in Grand Blanc, Michigan. Dr. Moutsatson is affiliated with and performs surgery at McLaren Central Michigan Hospital, MidMichigan Medical Center-Gratiot, MidMichigan Medical Center-Clare and the Mt. Pleasant Surgery Center. Carrie White, PA-C is a Certified Physician Assistant since 2011. Originally a native of Charlevoix, she has been in the Mt. Pleasant area since 2006. She completed her undergraduate collegiate studies at Central Michigan University in 2009. Choosing to pursue a career as a Physician Assistant, she attended Central Michigan University and completed her Master’s degree in 2011. Carrie is affiliated with McLaren Central Michigan Hospital. Dr. Lilly and Dr. Moutsatson are team Orthopaedic surgeons for Central Michigan University athletics. integrity in the management of our practice. Arthroscopic surgery is a minimally invasive procedure that is performed with a surgical device called an arthroscope (camera), which is approximately the size of a pencil. Fracture treatment include restoring alignment, promoting bone healing, and return of function as soon as possible to prevent stiffness and wasting of muscles. Our team of expert Doctors can quickly address all types of Fractures. Our expert team of providers, surgeons and clinical staff specialize in providing the utmost care and best possible treatment for Foot & Ankle care. From Achilles tendon problems to Ankle fractures, we have you covered. Orthopaedic conditions affect people of all ages, from newborns to elderly individuals. Our expert team of providers, surgeons and clinical staff specialize in providing the utmost care and best possible treatment the pediatric population deserves. Central Michigan Orthopaedics provides comprehensive sports medicine care in the region. Our premier providers, surgeons, and staff will connect you to the appropriate continuum of services and treatments needed. 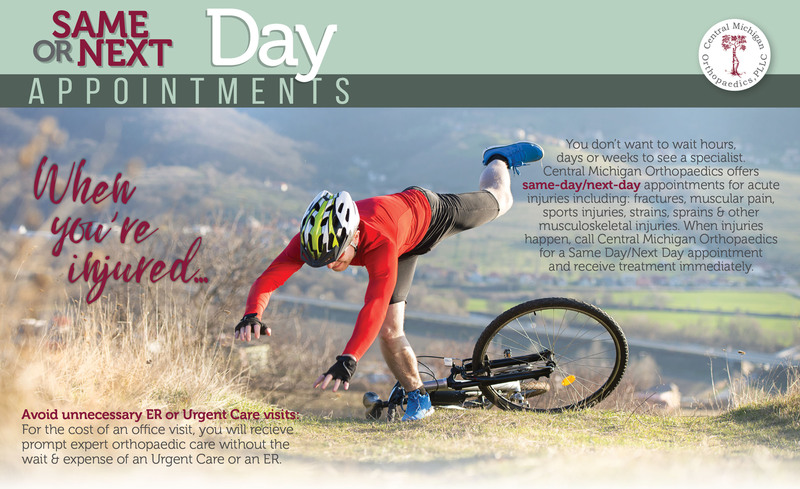 CMO NOW: Ask about our walk-in urgent orthopaedic care services. 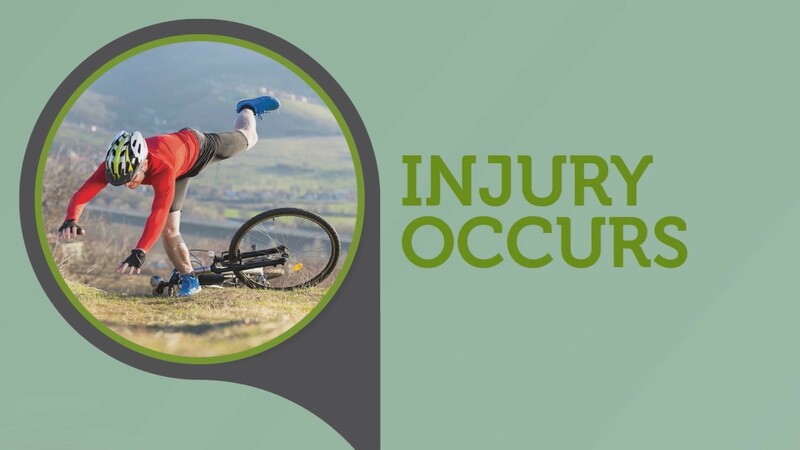 When You're Injured, Come See Us First! Central Michigan Orthopaedics updated their cover photo. This practice is highly recommended. Dr. Lilly and his entire staff are second to none. They were courteous, prompt and efficient. The office is clean, comfortable and modern. My surgical procedure was scheduled and completed with my needs foremost in mind, and I was on the road to recovery in short order. I'm glad I chose CMO. This is such a beautiful, professional, well organized office! I am beyond happy to call this location "HOME BASE" to everyone medical needs.You're all on my highest regards and recommendations. Dr Moutsatson is very knowledgeable and responsive and the staff is friendly and welcoming! Professional, knowledgeable, and caring staff! I am always able to get an appointment right away and feel exceptionally well cared for. Highly recommend! Great place, polite, courteous, knowledgeable staff and doctors. We didn't even have to wait maybe a total of three minutes. Dr. Lilly operated on my husband’s ankle when he broke it, and just scoped my knee to repair a torn MCL. Both experiences were positive for us. The care and attention at CMO is impressive. We would not hesitate to return there for any other future issues. Dr. Moutsatson and the entire staff are awesome! I would never consider another orthopedic office or surgeon! Dr Lilly did a repair on my son's knee last fall, he is still symptom free and Dr. Lilly always took the time to explain what he did how it would heal and ask if my son had any questions. One year ago, June 13th, Dr. Lilly preformed rotator cuff surgery on my right shoulder. He did a fantastic job! Today I have no issues with my shoulder. I had anticapated that there would be considerable improvement, but the shoulder is back to where it was before the injury. His office staff are efficient and pleasant. Thank you. It is our mission to make people better every day through excellence in orthopaedics and to provide each patient a compassionate experience. Our vision is to be the preferred provider in orthopaedic care, by meeting patient needs with the best quality, through excellence in patient care, growth in technology and integrity in the management of our practice.